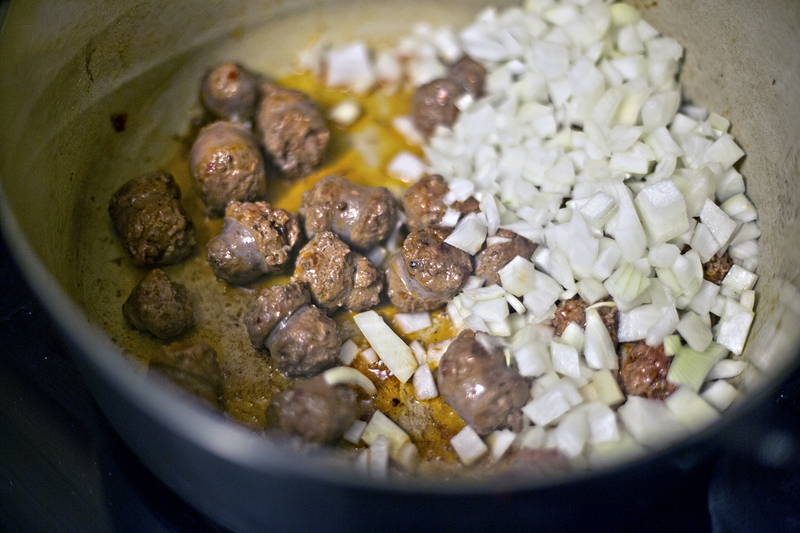 Using venison sausage instead of making meatballs makes this a lazy soup indeed. This is kind of a far cry from real-deal Italian wedding soup, and it’s also kind of a mash-up of Italian wedding and Tuscan white bean and kale soup. (Yes, Italians are probably shuddering at the thought – until they realize this soup comes together in 20 minutes.) This is also one of those recipes where it’s really awesome to put an old cheese rind into the broth for extra flavor, especially if you are just using water. Just scrape any mold off, throw the rind in with the broth/water and look at that, extra flavor. I (heart) garlic, and garlic (hearts) me. 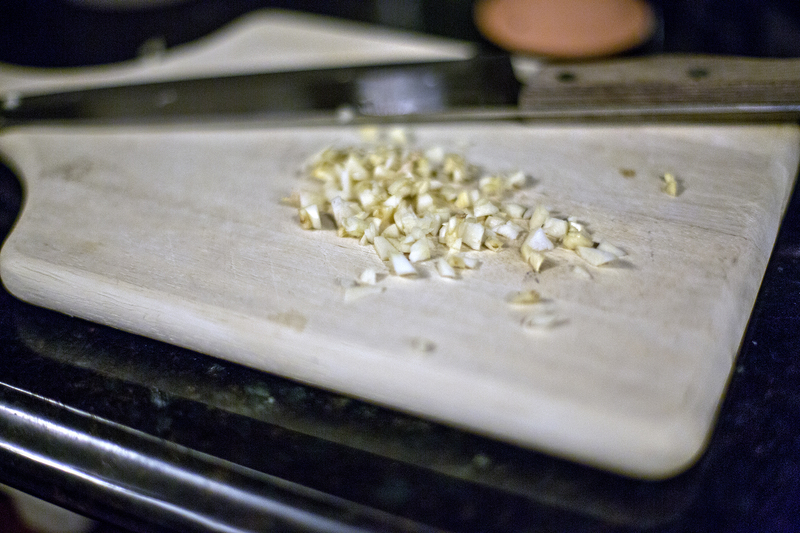 I’d sing a song for garlic, but it doesn’t really rhyme with anything. Instead of going to all that trouble making meatballs, I cut the sausages into about 3/4 inch pieces and when they cook they come out of the casing a little bit and get nice and round, just like little meatballs. Done and done. You don’t want to cut the fresh sausage any larger than about 3/4 of an inch or else they will be a little too large to be bite-sized, and since it’s sausage and not a meatball it’s a little harder to cut up with your spoon. The best thing to do is stem your kale first to get that out of the way. Then get your sausage going and chop the onion and garlic while the sausage is cooking. You’ll have a flavorful soup in about 20 minutes flat. Seriously, the slowest part of this recipe is preparing the kale so if you can find a bag of baby kale or pre chopped kale this will literally make this a 15 minute soup start to finish. And yes, I forgot to grate the cheese on top when I took the pictures. Sue me. Heat oil in a large soup pot or dutch oven. Add the sausage chunks and sear until almost cooked through. Add the onion, garlic and salt and pepper to taste and sauté until soft, about 3-5 minutes. Add the broth and scrape up any bits that have stuck to the bottom of the pot. Add the cheese rind if using. Bring to a boil. Add the beans, kale, and more salt to taste (if needed - if you are using store bought stock you will not likely need any more salt). Lower heat to medium and simmer the soup until the kale has wilted, about 10 minutes. Sprinkle grated cheese on top and let melt before serving. Non-game substitution: Any Italian sausage from the store slips right into this recipe. Vegetarian substitution: You can very easily omit the sausage and make this a vegetarian soup. 2 Comments on "Venison recipe: Lazy Italian wedding soup"
This soup is exquisite and doesn’t take long to make. Could substitute spinach or even Swiss chard for the kale. I put on weight reading about this soup! It’s meat and potatoes in one pattie!